Ultrafiltration is a separation process using membranes with pore sizes in the range of 0.1 to 0.001 micron. Typically, ultrafiltration will remove high molecular-weight substances, colloidal materials, and organic and inorganic polymeric molecules. Low molecular-weight organics and ions such as sodium, calcium, magnesium chloride, and sulfate are not removed. Because only high-molecular weight species are removed, the osmotic pressure differential across the membrane surface is negligible. Low applied pressures are therefore sufficient to achieve high flux rates from an ultrafiltration membrane. Flux of a membrane is defined as the amount of permeate produced per unit area of membrane surface per unit time. Generally flux is expressed as gallons per square foot per day (GFD) or as cubic meters per square meters per day. 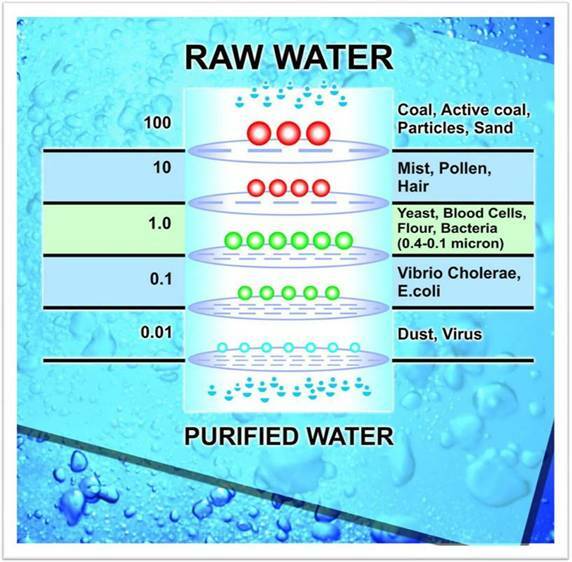 Ultrafiltration will find an increasing application in the production of high purity water. The basic principles outlined here should help in the understanding and use of this technology.